The gutters and downspouts have to operate without leaks, free of clogs and exit the water efficiently. There are several tips to ensure this. The gutters should be cleaned normally at least once a year. This is mainly a job requiring ladders, a bucket and a scoop. Placing leaf strainers at the ends will filter the debris for the downspouts. After the cleaning, it's time to consider ways to prevent future debris from collecting inside. Independent of typical cleaning, and usually where there are no depositing leaves, the basins should be checked for an accumulation of roof granules (notably where shingles are wearing). There is a seperate method for cleaning granules from gutters and this will help to increase the flow of water and releive the weight of stress. The effectiveness of clearing by robot depends largely on the type of debris being cleaned. Leaves can be swept out of the gutter basin with this choice although this does bring some cleanup from the ground where the debris is redistributed. Sticks might hurl or break, and thin or small, low lying debris like needles are tougher to reach with the auto method. Covering the top of the open gutter, the plastic and metal guards mainly filter out leaves and other debris. Typically to put these in, tuck the upper side under the lower shingle course and clip the lower into the outer edge. Metal screens are durable, however these involve cutting the screen with metal snips and perhaps metal fastening to the upper edges. The guards are effective in keeping out the leaves and larger matter while the smaller stuff gets washed away. The grade at which gutters should be sloped is 1/16" per lineal foot, at minimum. Keep in mind though that other factors like roof pitch, square footage and gutter size will affect how the water is routed away. If this needs adjusting, the downspouts may need cutting at the ends. The nails will have to be removed & reset - when doing so if any holes or breaches remain, these must be patched. 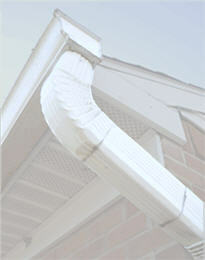 Hidden hangers are an excellent way of re-securing the gutter. They are concealed from ground-level. Another alternative is the nut-head spike with sleeve that are ratcheted on. And these do have grip, although this head will stand out as different among other flat waffle-style heads. Clogs are normally in the downspout port, building in the arm and elbow. Retrieve the clog with a long screwdriver, or a coat hanger pulling on the clog, and then run water through it. Some clogs just cannot be forced - you might have to drill out the rivets with a 1/8" bit and remove the arm. As a rule, the splash blocks should be set on a slope of 2 to 5 degrees which is the norm for around perimeter structures, to keep water and excess moisture from infiltrating the foundation of the building. View the flashing, that runs under the bottom course shingle and diverts water down into the gutter. These may need to be installed if water is coming from behind the gutter, and the water is not overflowing. See the roof valley sections. If any rust is evident, these areas will need to be sanded with emery cloth, primed with a rust inhibitor and at least two-coated with a quality finish. Note: stainless metal screws and fasteners have a reputation for being just that, but when mated with gutters and downspouts made of aluminum, they might result in corrosion. Rust is a natural enemy of gutters and spouting and once stained, factory finishes will seldom clean.